Sounds off-putting, a liquid paste of wheat flour and boiled oct0pus but, really, there’s something to these Japanese “takoyaki” balls. 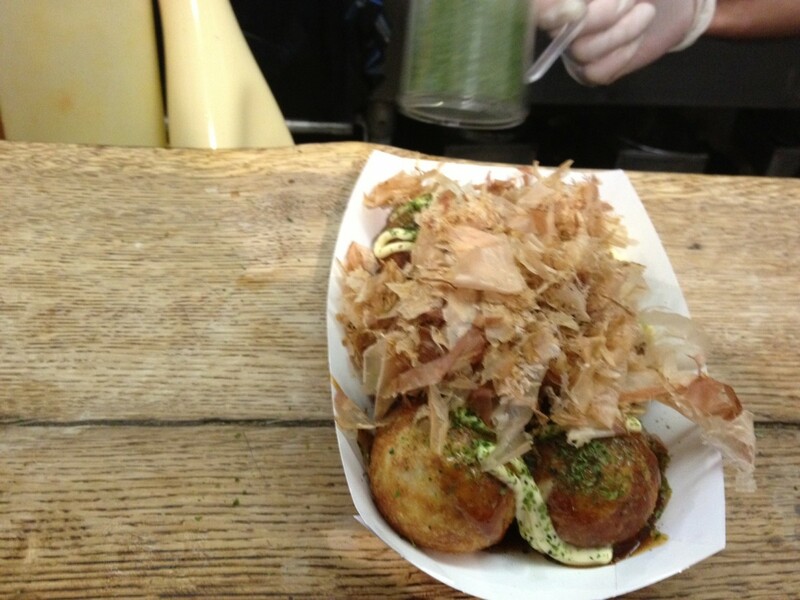 At OTAFUKU, NYC, the glutinous mixture of the takoyaki is grilled in special spherical pans to create a wonderfully crunchy skin. Once done they are finished off with a squeeze of sweet okanomiyaki sauce and spicy mayo and then topped with a shake of grated seaweed and bonito flakes. 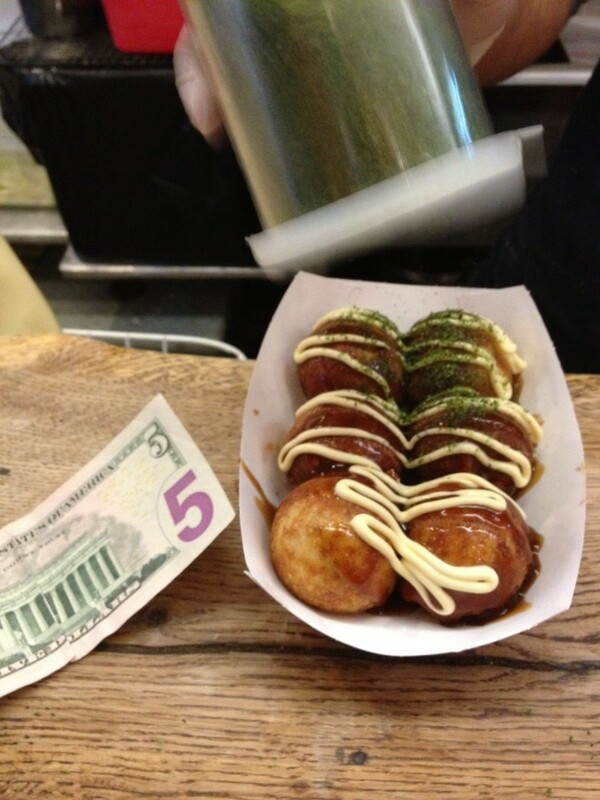 I’ve never been to Japan but I’m told that these tasty orbs are the real deal in Japanese street food eats. The six ball portion arrives slathered high on a paper tray and, even with the recent $1 price increase, they’re still a total deal at $6. Heck, you might want to split these big balls – after a few of them you’re likely to peak on the salty-meets-sweet and crunchy-meets-gooey texture bombardment that pleasingly takes over your palate and gullet. The shop is pushes the fun design concept with its menu covered walls but the kitchen and counter take up most of the closet-sized space and there’s no room to eat but for a small bench in front of the shop. Standing street-side eating might be awkward but these Japanese balls arrive hot and need to be eaten on the spot. So, that’s what we did on a chilly March day and, in the midst of a wonderful umami moment paid the price when a wind gust sent a dusting of bonita flakes on my frustrated companion’s Burberry coat. Even still, she had a ball.